My BH (Big Hubby) and I became interested in gold several years ago. Some friends took BH under their wings for the summer (while I stayed home and slaved) and taught him to dive and run a gold dredge. Now, let me tell you how I learned to dive, dredge and become the world’s greatest rock man or rather “rock woman.” Good old BH took me down, and we had this custom-made wet suit put together. Now you realize BH didn’t do this out of the goodness of his heart. With a great shape like mine, I defy you to get one of those cute slinky things off a rack! 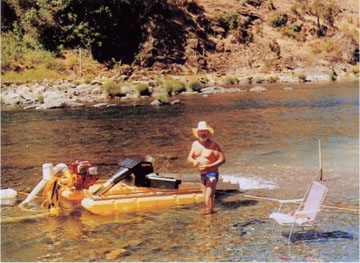 Being a kind, considerate BH, he decided the river was too fast and deep for me to learn to dredge in, so we headed up to Thompson Creek, a beautiful creek about 11 miles out of Happy Camp, California.”Better place to start,” BH says. “Not too deep,” BH says. “Clear water,” BH says. BH was really looking out for me. What a great guy, right? Let me tell you how it really was. First, I was sure I’d freeze to death even with 100 degree temperatures outside; the water must have been at least 40 degrees cold! 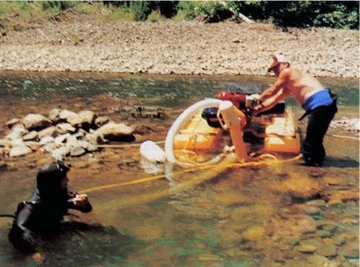 During my first day at the creek, we were taking the dredge off the top of the truck. Now, I’m a little on the short side but pretty strong. Anyway, good old BH drives our truck with dredge down pretty close to the water. He climbs on the truck, gives our 5-inch triple-sluice dredge a push, and yells for me to catch it as it slides off the truck rack! Well, after I picked myself up and reminded him my insurance premium had not yet been paid that month, I asked him politely to be a tiny bit more careful about dropping 300 pounds on my head. I had a few other ending words for him, but you just can’t share all the intimate things in life. So I picked up, rolled, kicked, shifted, propelled, pushed, and coaxed a few million rocks and boulders of various sizes and created the start of my very first dredge hole. This was all minus the dredge, which was floating by my side without so much as a pop-pop from its engine. Ahhh, but I was on my way after clearing an area the size of my living room of all rocks and other miscellaneous stuff. I was a ROCK MAN*! **# with experience. I knew I could toss cobbles with the best of them. Then, it was BH’s turn. He revved up the engine on the dredge, put on his mask, dusted off his sitter-downer and told me to watch very carefully, as he was going to get this hole going and show me how to get some real work done. I watched very carefully and wished I’d left just one rock that I could sit on, but then I am the efficient type. About 15 minutes later, up popped BH’s head, out comes the air line, off comes the mask, and guess what? Yep, it’s my turn. When learning to dive the first time, it is a good idea to first stand on good solid ground, stick your face underwater with your mask and regulator, and continue to breathe until you feel comfortable about breathing underwater. When gearing up for a dive, always, always start by putting on your air first. Insert the regulator ¾ the thing you breathe through ¾ into your mouth and only then put on your weight belt. We don’t want you to fall over backwards and drown from the weight! Personally, I’m like a beached whale when I fall on my back; I need help to get turned over. So, put on your mask, get your BH by the hand and head for the hole. He can show you what to do from that point. If your BH is like mine, he’ll stick the nozzle in your hand, point you in a direction, and tell you to keep going until you bring up the gold. I did bring up a little gold and learned what to do, with a lot of help from BH. We’ve been mining now for a few years, and I’m starting to get BH trained into my way of doing it. After all, who would know better, BH or me, considering that in this family at least, I’m the ROCK MAN! **$# with experience. I gotta go now; the coffee’s boiling over on the stove, and BH is giving me directions on coffee making.